Picture: the sanctuary of SS Gregory & Augustine, showing the newly painted reredos and the restored statues of St Joseph and Our Lady, shown in more detail below. Fr John, can you tell us a little about the history of the church, and what it was like when you became Priest in Charge? The parish of SS. Gregory and Augustine – traditionally called “St Gregory’s” for short – was established in 1912. It lies to the north of the Oratorian parish of St Aloysius, and includes in its boundaries the village of Wolvercote. St Gregory’s has many literary connections: former parishioners include Graham Greene, the poet Elizabeth Jennings, and J. R. R. Tolkien; Monsignors Ronald Knox and Vernon Johnson also came here as visiting preachers. The church, which is Grade II Listed, was designed, in the Flemish Renaissance style, by one of the leading architects of the Arts and Crafts movement, Ernest Newton. A series of faithful priests, of traditional disposition, have ensured that it has never been spoilt by “re-ordering”. When the original, wooden altar (equipped with altar stone) is pushed to its proper position on the east wall of the sanctuary for the offering of Holy Mass in the Extraordinary Form, the church looks much as it did in 1912 – with the exception, of course, of our splendid new reredos. Can you tell us about the overall plans for the restoration and development of the church, and how they relate to the original intentions of the builders and the historic furnishings of the Church? 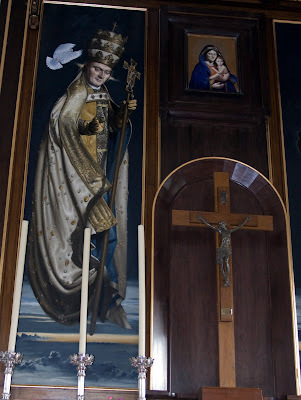 A generous bequest three years ago from the late Miss Kathleen White emboldened us to undertake what at least two of my predecessors considered, namely, the providing of the church with images of its two patrons in a restored reredos and sanctuary. The original reredos had three panels covered in Spanish leather, which forty years ago was replaced with wallpaper. By 2005 the wallpaper, though originally of high quality, was in a sorry state, faded and peeling. The parish, working closely with the diocesan Historic Churches Committee, commissioned the English painter James Gillick, his architect brother Gabriel, and other members of the Gillick family of Catholic artists to undertake the work of restoration. In the left-hand panel James has painted an image of Pope St Gregory, resplendent with Papal tiara, cope, and cross, and accompanied, as he is traditionally shown in Christian iconography, with the Dove, representing the Holy Ghost. 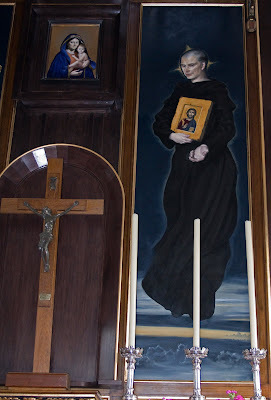 On the right-hand side is St Augustine of Canterbury, sent by Pope Gregory to bring the Faith to England, and shown here as a simple Benedictine monk carrying, in accordance with the account given us by St Bede, an icon of the Divine Saviour. 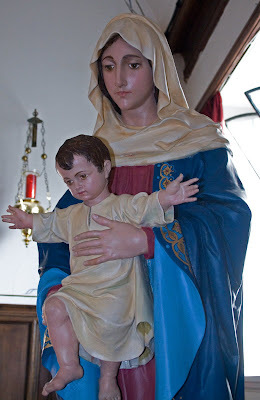 In the centre of the reredos, and above the two patron saints, is Our Lady with the Holy Child. I have christened her “Our Lady of Summertown” – the name for this suburb of Oxford. On either side of the reredos, on two sets of five panels, James Gillick will be painting images of the saints of England and Oxford as well as of SS. Peter and Paul in permanent commemoration of the Pauline Year. 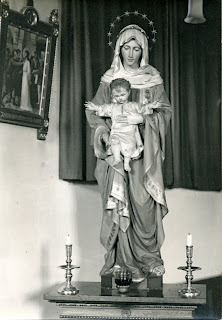 The statues of Our Lady and St Joseph, carved in wood before World War I by Ferdinand Stuflesser of the Austrian Tyrol, at present stand on tables on the opposite sides of the sanctuary. They are to be placed on the northern and southern walls of the sanctuary on plinths being carved in the style of the present altar canopy by the father-in-law of our architect. The statues have also been restored to their original decoration by Gordon Gillick, the painter’s father. Curtains in dark purple have been made by the seamstress Hannah Gillick to cover the reredos and side-panels during Passiontide. 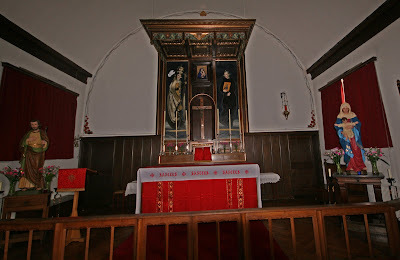 The carpentry for the new exposition throne and crucifix niche above the tabernacle was done by Benedict Gillick. Our painter, who is a practising Catholic and regards his art as a service of God and the Church, has depicted the saints in a posture of adoration and intercession. Their eyes and hands are directed to the Lamb of God really present and being offered, under the sacramental species, on the altar. 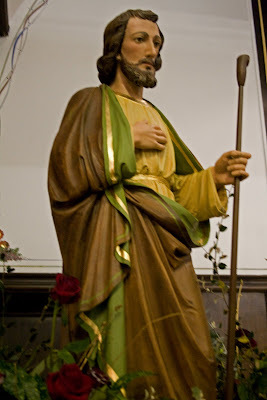 In this way, James gives visible expression to the Communicantes in the Canon of the Mass, that is, to the Church Militant’s communion in prayer and worship, in the Holy Sacrifice, with Our Blessed Lady and all the saints of the Church Triumphant in Heaven. Pictures: the statues have been brought to life by the sensitive restoration of the paintwork. Notice the detailing on the edge of the cloaks, which can be seen in the black and white photograph (which dates from the 1940s) but had been lost for a generation. Does the existence of two forms of the Roman Rite impose limitations on what it is possible to do, in the way of restoration? The limitations are entirely of the prudential and pastoral order. As you well know, in many places (though not at St Gregory’s), the liturgical changes of the 1960s were imposed insensitively according to the hermeneutic of discontinuity and rupture. It seems to me that priests such as myself who strive to recover the riches of Holy Tradition for the glory of God and the spiritual good of our people must not replicate in that cause the insensitivities of the past. We must therefore show immense patience and kindness towards those who are troubled by aspects of the restoration of the classical Roman liturgical tradition. But, of course, true kindness must include the willingness to catechize, to enable them to understand what it is that by his words and example the Holy Father is teaching us. 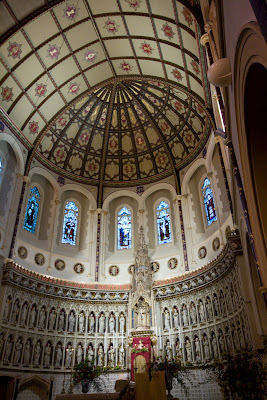 Pictures: the Oxford Oratory, whose parish borders SS Gregory & Augustine's. 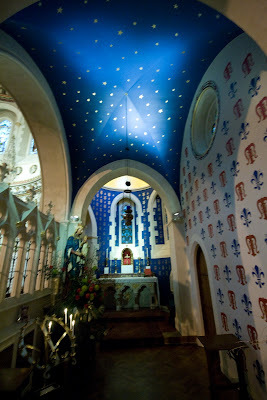 The first stage of the restoration of the Oratory was the redecoration of the Lady Chapel, shown here. The Oratory has Traditional Low Mass on Sundays, and Sung or Low Mass on Holy Days. How have the parishioners reacted to the plans and the ongoing work? The reaction has been overwhelmingly favourable, almost ecstatic! There has also been a most generous response – despite the Credit Crunch – to our appeals for financial support for the project. How are you in fact raising money for the restoration? First, by a direct appeal to the parishioners: on the Fourth Sunday in Advent we held a highly successful second collection for the project. Secondly, we hope in the next few weeks to set up a dedicated website for fund-raising, which will include an on-line auction, of, among other things, Formula One memorabilia. (As you can see, we are traditional in faith and practice at St Gregory’s, but on the cutting-edge with technology!) Those reading this interview who would like to contribute should make their cheques payable to “St Gregory and St Augustine’s Church” and send them to me, Rev. Fr. John Saward, St Gregory’s Presbytery, 322 Woodstock Road, Oxford OX2 7NS, England. Picture: the sanctuary of the Oxford Oratory, where original stencilling, painted over in the 1950s, has been restored, and stonework revealed. Work is continuing alongside fund raising. Today we are witnessing locally the progressive restoration of St Birinus in Dorchester, the Oxford Oratory, and your own church of SS Gregory and Augustine; similar work is being undertaken all over the country. Do you think that this reflects a change in the atmosphere in the local and wider Church? Do you believe that the work currently going on in SS Gregory and Augustine and elsewhere will survive to be appreciated by future generations? It is interesting to note, and it is surely no coincidence, that the three parishes in the Oxford area engaged in the beautification of their churches are all committed to the Benedictine mission of liturgical restoration and have weekly celebrations of the Traditional Latin Mass. What a wonderful sign of the vitality of Catholic life in our diocese and deaneries that, instead of dismantling sacred beauty and closing down churches, we are enriching and restoring them! The long weary years of Iconoclasm in the Byzantine Church in the eighth and ninth centuries were followed by what the liturgy of that Church calls the “Triumph of Orthodoxy”. Please God, that is what we are witnessing in a small way in these three parishes. In the words of St Edmund Campion’s “Brag”: “The expense is reckoned, the enterprise is begun; it is of God; it cannot be withstood. 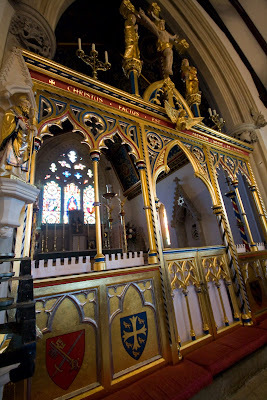 So the faith was planted: So it must be restored.” Final picture: the newly gilded Rood Screen at St Birinus, Dorchester-on-Thames, a major step in the on-going restoration of that church by its parish priest, Fr John Osman. Fr Osman says the Traditional Mass each Saturday morning and on other special occasions.